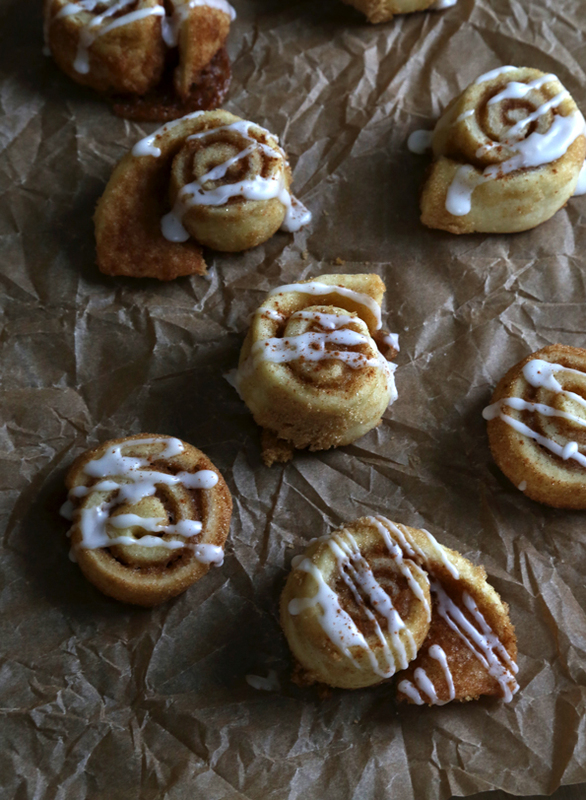 Gluten Free Cinnamon Roll Sugar Cookies | Great gluten free recipes for every occasion. These gluten free cinnamon roll sugar cookies somehow manage to be soft and tender, and even light and flaky. 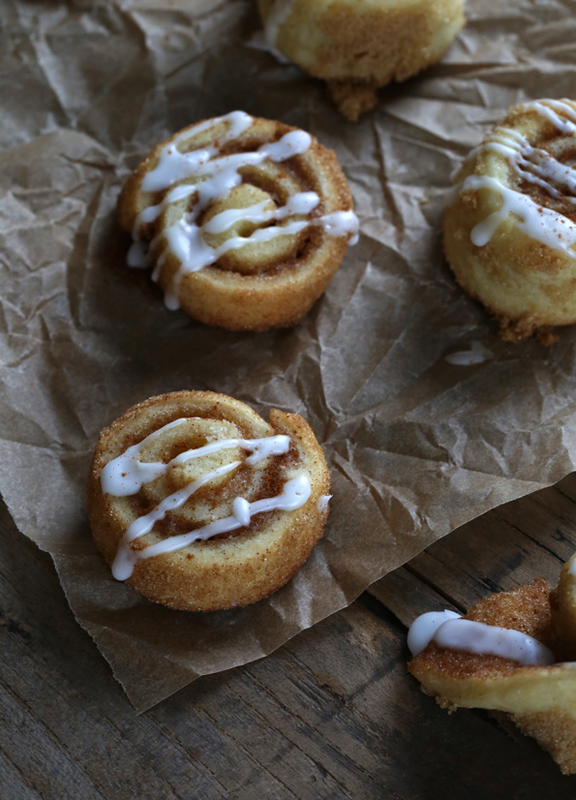 Just like a “real” cinnamon roll—but in a neat little cookie. And no rising time. They’re cookies, after all! This recipe is pretty similar to my Soft Frosted Sugar Cookies, but made a bit softer and made to brown a bit with another egg and a bit more butter. That’s it. Well, unless you could the brushing of the rolled-out dough with softened butter, the generous sprinkling of cinnamon-sugar, and the light drizzle of a simple sugar glaze. Oh, that. I made these pretty small, since, well, they’re adorable that way. 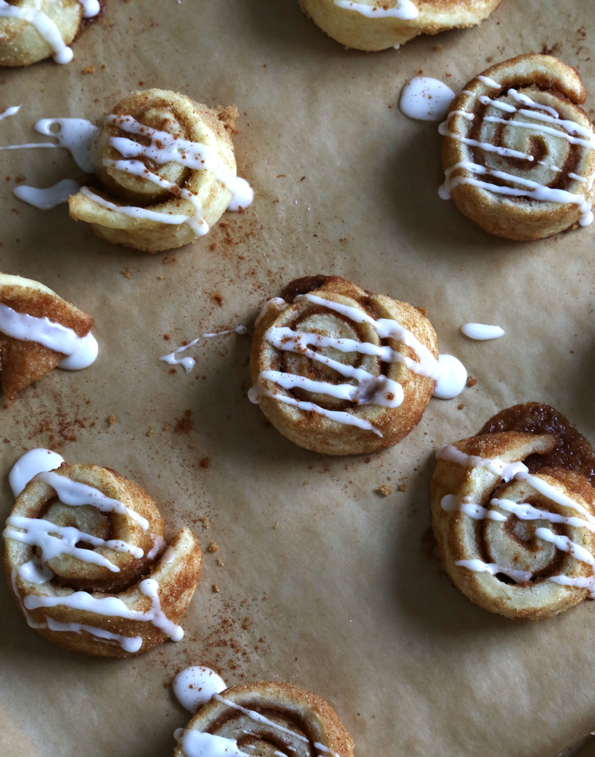 That, and it’s super fun to eat them like I, personally, think is the right way to eat real yeasted cinnamon rolls: unroll them slowly, tear off the unfurled roll in sections, then let the slightly crisp edges give way to that melt-in-your-mouth cookie inside. 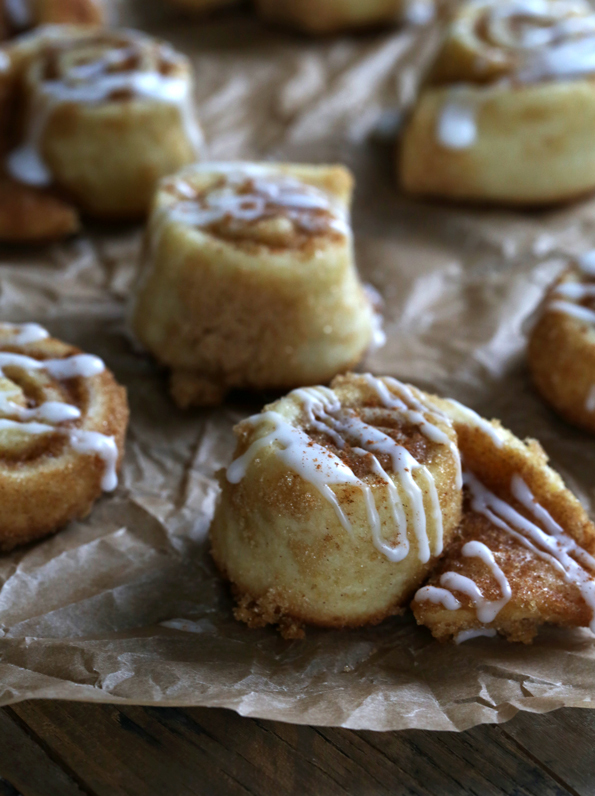 They even manage to be kind of light and flaky, almost like a real cinnamon roll. Magic! When a plate of cookies gets passed around in my house, everyone tries to play it cool and act like they don’t care which one they get. That little game of pretend is even harder with these cookies than usual. You see, everyone has a favorite type. Mine? The ones that are juuuuust beginning to open up, like the one on the right in the photo just above. I bet I’ve already eaten that one! My youngest makes no secret of going for “the biggest one, please.” Is it still gluttonous if you come right out and say it? Probably not! If you’re looking for another innovative way to enjoy cinnamon rolls, try this Gluten-Free Cinnamon Roll Cake from Gluten-Free Palate. Such a super-smart idea, Chrystal. See that one with the brown sugar and cinnamon filling that leaked out a bit on the right? That would probably be my husband’s pick, if I had to guess. My oldest? She’d take the one with the most glaze, as her sweet tooth knows no bounds. My son would probably take the one he could get into his mouth the fastest, so location would probably be his guide. Which type is your favorite? First, make the cookie dough. In a large bowl, place the flour, xanthan gum, baking powder, salt, granulated sugar and confectioners’ sugar and whisk to combine well. Add the butter, eggs and vanilla, and mix to combine. The dough will be thick and smooth. Roll the dough between two sheets of unbleached parchment paper into a 12-inch square, a bit less than 1/3-inch thick. Remove the top sheet of parchment paper, and spread the butter from the filling in an even layer on top of the entire surface of the dough, all the way to the edges. In a small bowl, combine 1/2 cup of the brown sugar and the ground cinnamon and mix to combine well. Sprinkle the cinnamon-sugar mixture on top of the melted butter, and spread into an even layer, again all the way to the edges. Using a sharp knife or pastry cutter, slice the dough into 4 squares of equal size (6-inch squares). Roll each 6-inch square tightly into a coil. Spread the remaining 1/4 cup brown sugar on the parchment paper, and roll the coils in the sugar to coat the outsides of the coils. With a sharp knife, slice each of the coils by cross-section into 6 pieces of equal size, each about 1-inch thick. Place each piece, about 2 inches apart from one another, on the prepared baking sheet. Place in the center of the preheated oven and bake until the cookies are puffed, pale golden and somewhat firm to the touch (about 11 minutes). Remove from the oven and allow to cool to room temperature on the baking sheet. They will crisp around the edges as they cool. When the cookies are nearly cool, make the glaze. In a small bowl, place the confectioners’ sugar and 1 tablespoon of milk. Mix well, until a thick paste forms. Add more milk by the 1/4-teaspoon, mixing to combine well, until the glaze falls off the spoon slowly, in a thick but pourable glaze. Add milk very slowly, as it is much easier to thin, than to thicken, the glaze. If you do thin the glaze too much, add more confectioners’ sugar a teaspoon at a time to thicken it. Drizzle the glaze over the cooled cookies, sprinkle with a bit more ground cinnamon, and allow to set at room temperature before serving. Brilliant concept from Mel’s Kitchen Cafe (hi, Mel!). Cookies adapted by adding a tablespoon of butter and another egg to my Soft Frosted Sugar Cookies recipe. Thank you so much, Nicole!! 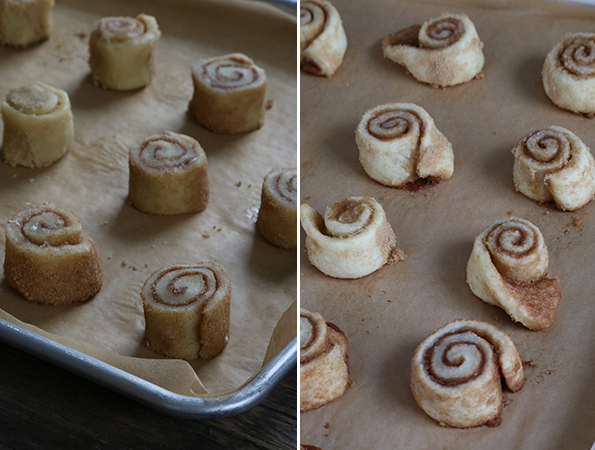 Cinnamon rolls are a weakness of mine–I can’t wait to make these cookies. If they taste half as good as they look, they’ll be amazing!! I was just thinking that cinnamon rolls would be perfect for this rainy weather we are having (finally)! These look delicious. I was wondering, however, how sweet these are? Ya know, with the cookie instead of the yeasted dough… Even though it only has half a cup plus some of sugar. Im ashamed to say that i have yet to try your soft frosted sugar cookie recipe. Your checkerboard cookies are my go-to cookie (so worth the time and effort). They’re not cloyingly sweet, anna, if that’s what you’re asking. These are sweeter than plan old sugar cookies, though, since they have the brown sugar filling, but they’re not as sweet as the sugar cookies once they’re frosted. If I were at home today, I would be making these right now. Look awesome!!! That’s it. I’m moving. Do you have any houses for sale on your street? I’m with your youngest – the biggest one please! It is kind of brilliant in its simplicity, isn’t it, Jennifer? Just fork over the biggest one! I would probably be on Brian H’s team for this one. LOL about Brian H. For everyone else’s benefit, that’s my husband, Brian. And for some reason, “Brian H.” is the moniker he uses when he comments on the blog. I guess he’s trying to fly under the radar?? I have to thank you again. Your dedication to your craft has allowed me to really love baking again. The “fun” of getting a fab product kind of disappeared with the gluten years ago, but your science and constant testing and “everybody can do this!” attitude nudged me back into the kitchen. Thanks so much, and thanks for not making it scary or making me need to take a week off work to bake some bread or cookies. You made it fun again. Denise, you’re the sweet lady from Twitter who took time to say those kind words. I’m so glad that I have been able to help you enjoy your time in the kitchen again. It should be fun just because it can be!